The Fir Bolg, sensible, hard-working and humble though they were, ruled in Ireland for only a short time. On a day thirty-seven years after they defeated the Formorians, a great mist descended, and in this mist, boats landed, and a wonderful race of tall, blond, beautiful people came to the land. These were the Tuatha de Dannan. They were the descendants of the Nemedians who had gone North. All the time they were away, they had been visiting four magical cities: Findias, Murias, Gorias and Falias, and in each city they had learned all the science and magic there was to be found. Their goddess, Danu, had told them to return to Ireland and take back their birthright. Not much is known about Danu herself, but some people think she is the same as Brigid, that Brigid is another name Danu held. Brigid was associated with fire and water, healing and spirituality. After Christianity came, the stories told about Brigid the goddess were transferred to Saint Brigid. The Tuatha de Dannan brought with them four magical objects: the first was the great cauldron of the Daghda. No matter how many people sat down to eat from it, they would leave full and the cauldron would not be empty. The second was a magic sword that always stayed sharp. The third was the spear that never missed its target. And the fourth was the Lia Fail, the stone of destiny, which roared out when the rightful King sat on it. This is now said to lie in Westminster with the Coronation Stone. 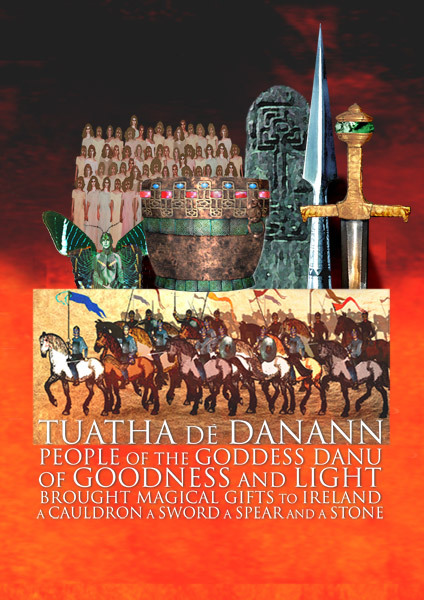 There were great characters among the Tuatha de Dannan. As well as Danu, there was Daghda, an enormously generous person with no sense of entitlement or his own importance. There was Aengus, the youthful, beautiful god of Love and happiness, and the Morrigan, the terrible War Goddess. The Fir Bolg were astonished to see these shining, beautiful people landing on their shores, and perturbed when they saw the Tuatha de Dannan burn all their ships, as a sign that they were in Ireland to stay. Overnight, a fortress sprang up in the magical mist, and the Fir Bolg approached it. A group of people came out and introduced themselves. They examined each others’ weapons. The weapons of the Tuatha de Dannan were light, bright and sharp and the weapons of the Fir Bolg heavy, blunt and unwieldy. They exchanged arms as a sign of friendship, and the Tuatha de Dannan proposed that they would divide Ireland equally between them. The Fir Bolg said that they would think about it. After talking it over amongst themselves, the Fir Bolg decided that they didn’t want to bow down and accept that other people were going to come and take half of their land away – the land that they had won – so they determined to fight for it. They met in battle on the Plains of Moytura. The Fir Bolg suffered heavy losses on the first day, and after the fighting was over, the Tuatha de Dannan again asked them if they would divide the land equally with them. Again, the Fir Bolg stubbornly refused. On the second day, the Fir Bolg inflicted a terrible blow on the Tuatha de Dannan: one of their warriors cut off the arm of the de Dannan king, Nuada. Under the laws of the Tuatha de Dannan, no one who was not physically perfect could hold the position of king, and so Nuada lost his throne, and the de Dannans were left leaderless. They rallied all the same, and the Fir Bolg were roundly defeated. Though they had won, the Tuatha de Dannan decided that they would give one of the four provinces to the Fir Bolg. The Fir Bolg chose the province of Connaught, and the Tuatha de Dannan took the rest of Ireland, with their seat at Tara.